Svetlana does her PhD research at the "Commissariat a l'énergie atomique et aux énergies alternatives" in Paris (France), which is focused on interactions between tectonics, evolution and climate. In her research project, Svetlana aims to explain why the climate changes every day based on tectonics analysis. 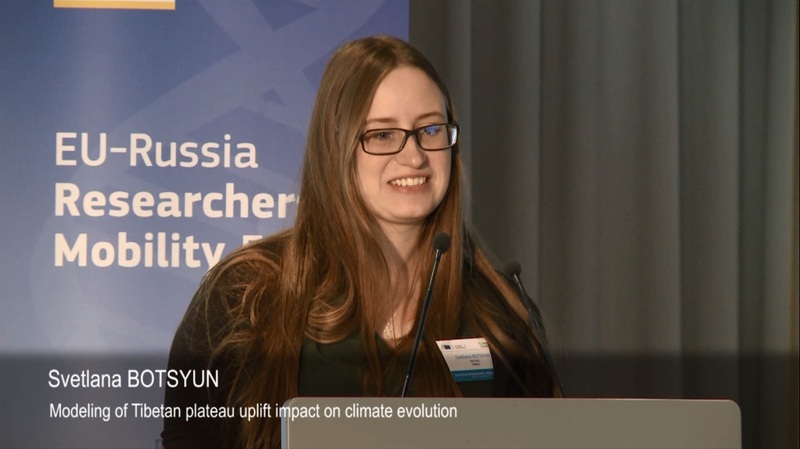 Find out more about Svetlana and reconstruction of climate patterns of the last 50 million years. The video was filmed at the elevator pitch session during the "EU-Russia Researchers' Mobility Forum", a symposium focused on partnership in science through mobility that took place in Brussels last 25 September. Fellows who have benefited from MSCA funding presented their own work at a poster exhibition combined with an elevator pitch session. Further information about Svetlana's research project is available on Cordis. More information is also available concerning the EU-Russia Researcher's Mobility Forum.